Relationships...admit it. You knew it was coming. And this won't be the last of it. I will preface this by saying..no I am not a relationship expert, and no I do not have all the answers..you know what I'ma stop saying that (yeah I said I'ma...I say that too) this is my blog...I have an opinion, you don't like it don't read it. So I had an interesting conversation recently with an older (not old but older...like 40) and we got to talking about how he and his girl had been together for 18 YEARS!!!! I couldn't believe it, he was saying they'd been together blah blah for a really long time and I was really inspired by the longevity of his relationship. So me, being the wedding lover that I am asked were they married. TO MY HORROR he said no. ARE YOU KIDDING ME!?!??!! 18 YEARS AND YOU DIDN'T MARRY HER!!?!?! I couldn't believe it. I think I just stared at him for awhile thinking to myself...for real? Like for real? 18 years? And I ask him....well did she ever bring it up? You guys ever think about getting married? He said yeah, she's brought it up, especially when her younger brother got married and we've had our ups and downs. So no, this is not a man bashing blog...and he's a really great guy so I won't dog him out. But I'm left to wonder....why? Why not get married, make it legal after so long of a commitment? And he made a valid point saying if it's not broke then why fix it? But still in my head, in my world...marriage has always been the goal. Thru the kids and trials, and the ups and the whatevers...there is still a committment made before God, each other, and our families that says "til death do us part". True indeed he could dip out the next day and the wedding could have been for nothing (which is also how he feels) but at the same time he could do that tomorrow. What's making him stay today is the same thing that would make him stay AFTER the wedding. A choice. But aside from the wedding he was talking to me about how she's a 'housewife' which kinda got me too. He was concerned that she's gonna really be messed up if anything happens to him. Which is totally TRUE!!! How you not working and you don't even have a husband? I dont' mean to judge but at what point did it get like that? How does one become comfortable with that as their reality? But at the end of the day he loves her and he says she starting now to get it together (their son is now 16...I'm just saying) so I wish them all the best and whatever goes on in their relationship has nothing to do with me and they deserve all the happiness in the world. I simply learned something about myself in that conversation. And in an interesting turn...a lady that I know is leaving her position (a really good one at that) and going home to be a full-time mommy. When I asked her how she made that decision, she says she didn't. That her husband made it for her. That he noticed how busy she is all the time, how she doesn't really have time for her new (16 month) son and barely spends anytime with them. He gave her the option to get out. And an option she promptly took. Although she's a little nervous about being a full-time stay at home mom, she must love it. And she never thought she would have kids, shoot she never thought she would get married, so I guess that's the beauty of life...to roll with the things God gives you. A successful husband that can make that suggestion in this economy and a beautiful (I mean gorgeous) baby to share that journey with. But what inspired me about her story is that I feel like she has it all. Clearly I don't know what goes on in her home, but to me that signifies strength. She has worked pretty much her whole life and can afford to shop wherever she wants and has done all the traveling and seeing as much of the world that she wants, and also climbed the corporate ladder. And when the time came to put on her mommy hat...she's giving it all she's got. To have that option amazes me. That's why I'm not in a rush to get married or have babies or struggle with either of them. When the time comes my time will come (note to future husband I need at least 3 carats) and when the time comes. I hope to also be able to put aside all my accomplishments, for a season, and donn my mommy hat to give it all I got. These two women are bright, intelligent and have men in their lives that they love. But their stories are vastly different. And to me that teaches the importance of choice. What you choose today and choose everyday affects tomorrow. Not saying that I make all the right choices or that one is happier than the other cuz there's no way to know that. But it inspires me to choose carefully and cautiously. Now I gotta run cuz I have to clean my apt and make dinner! More to come! I HAVE to share this!! You know how you get so excited about something but no one is around or picks up the phone to talk? Well that happened to me tonight. When I left the theater. I went to the (sold out) packed SVA Theater to see a new film starring my southern friend Stephen Tyrone Williams and left the theater beaming! Like not just smiley girl that I usually am but BEAMING. ast 103 minutes I was not! 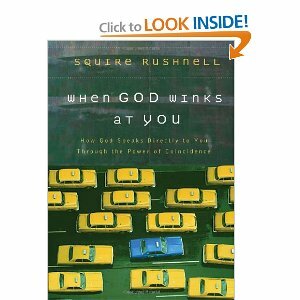 Children of God was the T.R.U.T.H. The film was beautiful. I mean beautifully done. Stephen Tyrone Williams was the truth. His body is the truth. I'm just saying...and not that I'm lusting after him but I can respect the effort this man puts in the gym. It was beautiful to watch. his countrymen still have some issues and are not perfect) and as I'm sure everyone knows being homosexual (esp a man) is not an accepted way of life. And this film explored that very well. It was captivating, moving, and I was inspired. race wasn't played a huge role in the film. Although one character was black and the other white (although he did say he wasn't white...but he was pasty) it never was really brought up. It was like they saw thru to the heart of the other person. and I can do a film and color won't matter...I digress. LA, you wanna do film that's where you need to be. I'm inspired because I"m meeting people EVERYDAY that are doing what I love and making it IN NEW YORK. Stephen went to the Bahamas to shoot this film. Do you know how incredible that is? He was snorkeling ON CAMERA! And where does he live? NEW YORK! Just goes to show you what is for you is for you...and you can be anywhere your heart desires. Oh but then when I was leaving I was so happy I wasn't really paying that much attention and I wore these huge heels...with kind of a weird platform and I jumped over a puddle of water and almost broke my daggum ankle! So ridiculous...tryna be cute. I might have screamed I can't remember. Ankle still hurt now. For real, this film got me so excited I don't want to do anything else. I'm supposed to be cleaning my house and prepping for tomorrow's dinner and I have a meeting with an agent tomorrow...so that should be cool. But anyway, the film did remind me of the first time I went to the Bahamas. So it was a little sad to watch on a personal note. 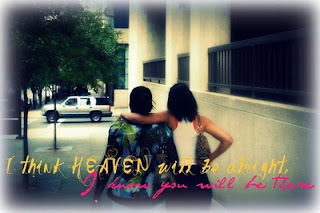 To the first Bahamian I know and love. Rest in Peace sister. You are in my heart forever. A Picture is Worth a Thousand Words..how much is a word worth? So...I tried to not blog yesterday so I wouldn't become one of those blog obsessed people, but whatever...get it while the getting is good. Blog while I'm excited about it I guess. I didn't want to comment on the idiotic comments that Slim Thug made recently...but I'm sorry I must. If not just a little bit. That's all the energy I have in my mind, body, and soul to comment on such statements that he made about black women. 2. He made me feel like I was the woman in the film. I don't even remember her that much, I mean I saw her but I really saw myself with him...he drew me in. That's what a great actor does. 3. His emotional connect with his opposite character (although not so much with his father, there was one scene where all I saw where inappropriate hands going every which way on his face and it made me uncomfortable). But the range of emotion that he had with his female co-star was truly inspiring. 4. It was the little things he did. Like the way he touched her hair and the forehead kisses that I remember this morning. Not necessarily everything that he said, but just the small things that a man does when he's in love with a woman. And it was evident in the way he touched her in the movie. The young lady in the film did a good job, although her name escapes me right now...let me look it up. Amanda Seyfried, sorry girl, I hope people don't forget me too! That was awful! I will do better. Overall the film mad me happy and sad and emotional (no tears tho and it was full of tears) and I'm glad I've seen it. Doesn't make me want to buy it and I'm not sure that I want to watch it again, well maybe, but it was good. Going to the screening of Children of God tonight to support my friend Stephen Tyrone www.stephentyrone.com. I'm uber excited! I feel like in this industry (I use 'like' A LOT) people are always asking you...so what are you doing now, even if you just finished a play or a film yesterday! It's like (there it is again!) can I just say nothing right now...I'm auditioning and haven't booked anything yet, jerk! But no, that would be rude. So I smile and say what I just finished and that I'm auditioning and in school working on my craft. Which is true...just a nicer way to say it. BUT! I actually do have something coming up pretty soon. 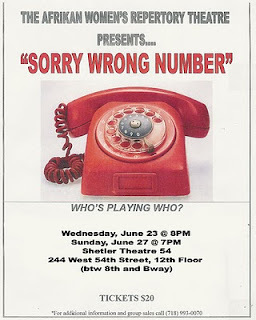 A new play festival that I'm doing. 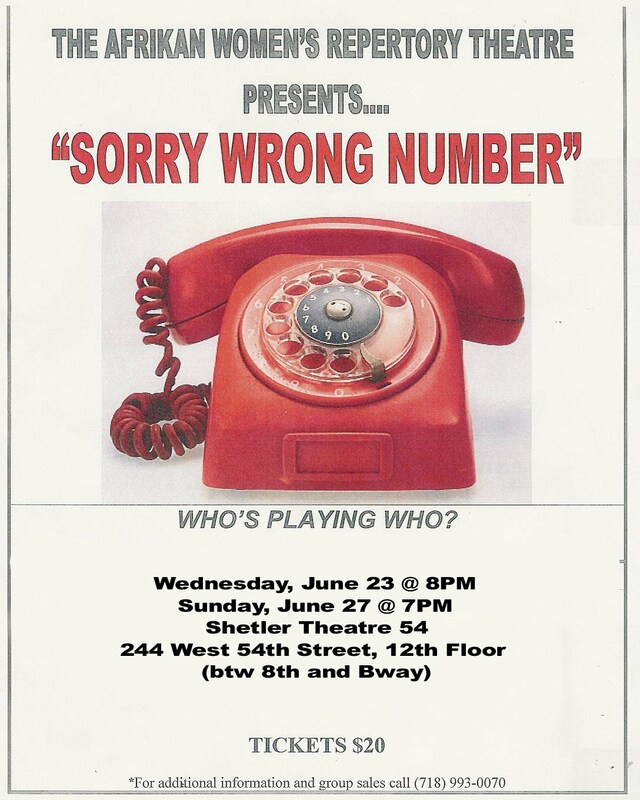 My play is called "Sorry Wrong Number" and I may be bias but ours is the best. We have two shows...June 23rd and 27th so that's cool. Tix are $20 and need to be purchased from me...or at the box office but we're trying to get it sold out, so you might wanna get it fast. Just saying. It's at Shetler Studios. Attached is the flier. How cool! I like this thing called blogging. This may be really cool. Another test to see if pix can go thru. This is a test to see if I can blog from my phone. If I can that would be shweeet!! So...for the past couple of years I've been talking about the things I've wanted...things I've wanted to do, etc. 2009 was the year that those things actually started HAPPENING. And today was a day full of just that...I've been saying I wanted a website...know exactly what I want on it, etc and have just been putting it off for YEARS. I've been saying I want to blog...but I've been putting it off for YEARS. I've been saying I've wanted to move to NYC or LA but I was putting it off for YEARS...I think I've made my point. "Do it now" has got to be my new mantra. If I want it now, I gotta do it now. Case closed. What else do I want? Oh yeah...a tv show. Thanks. Feature films. Thanks. National commercials. Thanks. A network of friends and comrades in NY...cuz I'm still new and it's weird not knowing many people. So....some posts will be longer than others...some I could probably just post on twitter and be done with it (www.twitter.com/coerlessly) but bear with me. I'm figuring this out just like you. This is my first blog post...kinda surreal...I've had a few of those moments this year. I expect SO MANY MORE. 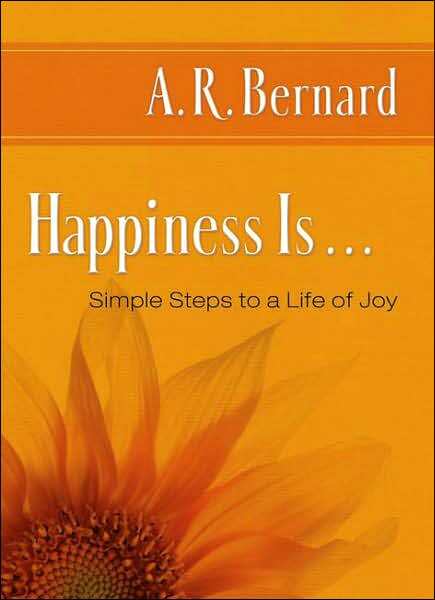 I have "The Secret" I built the vision board, I'm taking the classes...I'm making the steps, I'm enjoying my journey. I enjoy being me. I enjoy this process. I wonder what it's gonna look like in the end.